Believe it or not, crystals do more than just look pretty! Cleansing crystals provide a lot of amazing benefits. But, in order to experience all these benefits, you need to make sure you’re clearing, activating, and recharging them regularly. Read on to learn everything you need to know to keep your cleansing crystals functioning properly. Cleansing crystals have powerful healing properties. You can use them to clear away negative energy and remove energy blockages. They can also help you to shield yourself from negative energy. Cleansing crystals protect you from outside negative influences and bring about a sense of calmness, peace, and mental clarity. Celestite (also known as Celestine): This is a purifying crystal that brings about instant feelings of peace and harmony. Moonstone: Moonstone harmonizes negative vibrations and helps you feel more relaxed and receptive. Amethyst: This crystal detoxifies your spirit while providing your mind and body with feelings of relaxation and rejuvenation. Aqua Aura Quartz: This helps balance the four upper chakras (the heart, the throat, the third eye, and the crown). Larimar: This crystal — often referred to as the “stone of joy” — can help you feel refreshed and calm. Herkimer Diamond: This crystal clears the mind and helps to replace obsessive, anxious thought patterns with more helpful and harmonizing ones. Kunzite: Kunzite heals and purifies the heart and pulls out energetic toxins. Selenite: This crystal cleanses the aura and draws out negative or stagnant energy while balancing the chakras. Chrysoprase: Chrysoprase removes blockages and old pain while helping you feel more receptive to new experiences. As you can see, there are lots of cleansing crystals to choose from. There’s no one type of crystal that’s right for everyone. It all depends on your specific energy and needs. Clearing your crystals regularly helps get rid of negative energy that gets stored in them. It also makes them more powerful and allows you to receive more of their benefits. Soak your crystals overnight in a solution of sea salt and water (as long as the crystal is not too brittle). If you have a brittle crystal, it will end up crumbling and falling apart in the solution. You can also hold the crystals under running water while putting a specific intention into the crystal to remove negativity. Try adding crystals like Carnelian or Clear Quartz to the bag where you store your crystals. This will help them stay clean for a longer period of time. Some people enjoy using sage to smudge their crystals. They often do this while asking for protection or dedicating love to their crystals. The moon and sun have feminine and masculine energies (respectively) that add a lot of power to your crystals. Placing your crystals under the moon or sun also helps clear and program them for extra vitality and potency. Burying your crystals will clear them of all lingering energy. Use your intuition to figure out how long you should keep them buried. If you feel that none of these methods are effective, you can also use a couple of drops of a crystal cleanser. Add it to water before soaking your crystals. Crystal cleansers often work best with brittle stones. While you’re clearing your crystals, it’s important to maintain a positive mindset. Otherwise, you’ll end up accidentally imbuing the crystals you’re trying to clear with more negative energy. The following are some additional steps you can take to activate and recharge your crystals while you’re clearing them. Remember, it’s imperative to avoid negativity when activating or recharging your crystals. This includes negative intentions toward another purpose. That kind of negative energy is like a boomerang — it will just end up coming back to you. You can program your cleansing crystals to help you feel calm and receptive while performing specific tasks. For example, some people program crystals to help them with creative tasks or to help them experience feelings of abundance. Once you’ve decided what you need assistance with, choose a crystal and ask it if it’s a willing partner. If you feel that the answer is yes, hold the crystal to your heart, then bring it up to your third eye. Imagine the task you want help with, then imagine that task being projected into the crystal you’re holding. State your intention out loud and thank the crystal for its willingness to help you. Finally, you’ll need to activate — or reactivate — your crystal. This essentially means you’re “waking it up” and giving it permission to do its job. Many people activate their crystals by rubbing them between their palms, breathing on it, or holding it close to their bodies. Try out each method — or try a combination of all three — to figure out which one works best for that particular crystal. Remember, every crystal is different. If one method doesn’t feel right, try another one. Over time, your intuition will improve and you may need to experiment less to choose the right approach. As you can see, it’s not enough just to let your clearing crystals sit pretty on a shelf. They need a bit of TLC if you want them to work properly. 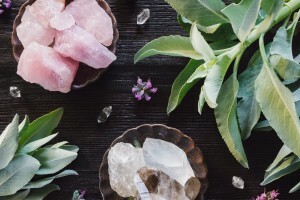 Now that you know more about clearing, activating, and recharging your cleansing crystals, are you interested in expanding your crystal collection? We’ve got all the information you need to become a crystal expert. Start by checking out this article on the seven healing crystals you need to own.